The latest venture of the pioneering impact-investing firm: healthcare delivery in East Africa. Since launching ten years ago with an endorsement from former President Bill Clinton, LeapFrog Investments has shown how a profit-with-a-purpose fund can be sustained by providing financial services to consumers in Africa and Asia who make as little as US$2 a day. Now the billion-dollar-plus private equity company, which focuses on high-growth, purpose-driven businesses in fast-growing markets, has taken a stake in its first healthcare business by investing US$22 million for a majority stake in a Kenyan pharmacy chain. The move into healthcare is yet another example of development “leapfrogging” — that is, bypassing traditional technologies or systems in favor of new ones that may accelerate progress. It’s also a logical step for LeapFrog, says Thomas Verghese, an associate director at LeapFrog and leader of their investment team. “Half of our existing portfolio companies in the financial services space have some sort of health product or managed care offering,” he notes. As a result, LeapFrog created a healthcare investment fund and assembled a team of nine people, including physicians, to explore healthcare investment opportunities. A deal with Goodlife Pharmacy was cemented in November 2016, and represents the largest direct investment in the East Africa retail pharmacy sector to date. LeapFrog’s interest in Goodlife is based on the key role pharmacies play in providing consumer healthcare services across Kenya and East Africa. Goodlife currently sells drugs and wellness products to more than 700,000 customers from 25 different locations across East Africa, and plans to expand its footprint to more than 100 stores over the next five years, according to Verghese. The Goodlife deal dovetails with LeapFrog’s mission of investments in companies that provide financial products, such as insurance, savings, pensions or credit, to the two to three billion consumers who are moving into the middle class in the developing world. The Goodlife deal also represents a potentially lucrative area: Kenya’s pharmacy sector is worth US$725 million and set to rise to US$1.3 billion by 2020, estimates LeapFrog. Drug prices are currently at an all-time low in Kenya, but access to medication can still be an issue. One problem is counterfeit drugs. Another is that hospital pharmacies are often overwhelmed with long lines or running out of medications. To get around these problems, many consumers self-diagnose and then go to a pharmacy as a first point of care. At Goodlife, trained pharmacists help consumers avoid misdiagnosis by providing basic medical advice and performing simple diagnostics such as blood pressure checks. Goodlife Pharmacy is also moving into telemedicine, allowing rural and peri-urban consumers access to medical care on-site virtually, avoiding a long trip to the hospital. LeapFrog’s healthcare team also focus on opportunities in single-specialty services, like ophthalmology and cardiology, noting regional challenges in subsectors such as standalone primary care clinics. 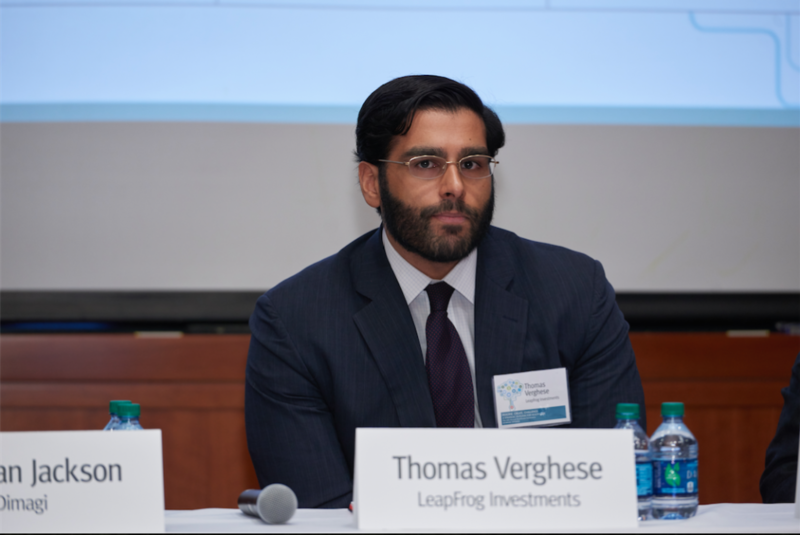 “Investors have traditionally struggled with primary care,” explained Verghese, pointing to challenges within the subsector, such as relatively low unit economics, referral dynamics, and difficulties in achieving the patient volumes necessary to sustain operations. Apparently, development leapfrogging has its advantages. Stephanie Schorow is a freelance writer based in Medford, Massachusetts.